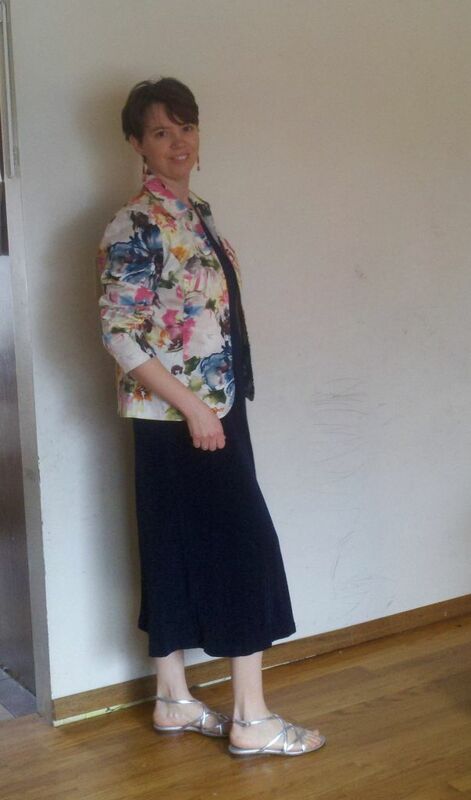 I bought this floral blazer at the thrift store last weekend, thinking it would be so much fun to wear for Easter. But I'm having a hard time styling it. Googling "how to wear a floral blazer", and "floral blazer site:youlookfab.com" gave me some ideas, which I've copied in the pics below. Do any of these work? How should I wear this? (Considerations: I'll be up and down from a stage a lot, so I need to move easily. I'll also be sitting on the stage with my knees facing the audience, but behind a row of singers, so nearly invisible there. Still, it make shirt skirts pretty precarious). The room will be well lit, but there won't be spotlights on me. #4 Dark bottoms, light top. This one is lace, and probably a bit distracting with the blazer. #5 Mid-tone (olive) bottoms, light top. #6 Was intended to be mid-tones, but the peacock is a bit bright - olive bottoms. #7 light bottoms, dark top. I feel like the white bottoms are too bright for the blazer and make it look dirty. #8 column of white - see how the blazer is more pearly - almost gray, next to my bleached whites? #9 White jeans, gray sweater. This one almost works to me - does the gray keep the blazer from looking dirty? #10 White jeans, peacock shirt. Or maybe separating the two whites is better? Other options that come to mind: An olive top under the blazer. Hot pink (but I don't have any - still, I'll probably visit the thrift store today, and maybe I'll find something? What are your suggestions? Feel free to tell me to ditch the blazer if I need to. I have plenty of other clothes and can wear something else for Easter if the blazer just doesn't cut it. I really like all the options with the white jeans (7-10). Cute blazer! That is a gorgeous blazer! I am jealous (have been looking for a floral jacket for a while now... ). My favorite look is #1 by far! It's amazing! The floral is great with both the color and shape of the dress. I don't like it as much with the dark colors in 2 and 3. It's great with the olive pants - I prefer #6 because I think the blue top is better w/ the blazer than the lace top. The lace top and blazer hem are too close in length for me. I like the column of white also (#8). The differences in tones doesn't bother me. Thank you Tanya and Diana! Diana, maybe I'll wear #1 to the Lion King tonight - I don't think the skirt would work for the amount of moving I'll be doing tomorrow. I'm leaning toward the white jeans - you don't think it makes the jacket look dinghy? You found a beautiful floral blazer and it looks perfect for Easter. I like it best with the white jeans, but also like it with navy. The olive pairing is my least favorite. Can the lace top be tucked? Then the hem length wouldn't be an issue. In the photos the white jeans and jacket color look fine together. Great find! I like it with the dresses and with the white jeans. Wow you have styled this beautifully. I was fully prepared not to like it, quite the opposite! I like #1 as a classic pretty look, but I think maybe that's a little less you? How do you feel in it? Then I love it with the white jeans, the last two are best because the coloured shirts make the different whites of the pants and jacket work. Are your legs a mile long, I think you wear white jeans extremely well! I like 6 and 10 the best -- love you in white jeans! Good observation Jules - I don't feel like #1 is very "me". It feels over-the-top to me. It is fun though, and were I feeling more adventurous, I'd likely try it. Joy - the lace top would work tucked, but I'm thinking I should find a different white top. The white and the navy are my favorite combos too, though I was really surprised to like the soft colors in #9. I'm currently leaning toward wearing #9 or #10. You've convinced me that the white jeans can work. I love nr 1 and 9, those are most springy to my eyes, BTW great blazer! I like #9 the best - you look pretty and comfortable! I also like #1, but maybe for another occasion. What a great find for you! It's nice to experiment with pieces like this, isn't it? I love #9, it stands out by a mile. I am not keen on combinations with black - somehow the outfits seem heavy, while the blazer dictates lightweight vibe. #1 is pretty as well. I also like #9 alot. BTW --- How'd Friday go? #1, 7 and 9 are my favorite. Beth Ann - Friday went really well. I wore slacks, and was asked at the last minute to do keyboard in addition to flute (not at the same time....). So the versatility of pants paid off. This afternoon I realized that I do really like #1. It felt so loud this morning on the really gray day. But the skirt needs its hem mended, and is too short for my activities tomorrow anyway. I'll wear it soon though. #9 will be tomorrow's Easter outfit. #1, #1, #1 by far! Stellar! #9 is my second favorite. Very pretty. Amy, will you forgive me if I go against the tide? I find the cut of the jacket quite dated. To my way of thinking its nice but not prefect. Take my thoughts with a grain of salt though, as when it comes down to it what matters is how you feel in it and how you view it. The colours and pattern are quite lovely on you. Later here, but I like 1, 2, 7 and 9. I'm taking notes as I just got a floral blazer too and now I might even pop it on today! Be impractical! Be glaring! (Can you tell I love #1?) Oh well, if not #1, I like the options with the white jeans (7, 9, and 10). Thanks for being so gracious Amy. Understanding how you see the jacket and it's role in your wardrobe makes a difference. What a great jacket! 6, 9, and 10 really stood out for me. I like it better with lighter colors, like in 1, I and 9. I find when it's paired with bald or navy it looks a bit harsh. Great jacket on you!